There was some question as to whether the Global Warming Policy Foundation would be allowed to stage its annual lecture at the Royal Society, but the FRSs finally agreed, on condition that two of their minders were on hand to keep an eye on the science, and Matt Ridley duly spoke on GLOBAL WARMING VERSUS GLOBAL GREENING there last Monday. You can read it here. Apart from his carefully differentiating lukewarmers like himself from us sceptics, I see nothing that anyone here would disagree with, and some very interesting observations on the way science, scientific publishing, and the IPCC interacted in the case of the scientist who discovered the link between increased atmospheric CO2 and the current greening of the planet, and who has since gone out of the way to say how absolutely horrid the gas is. Dana Nuccitelli has replied on behalf of the 97% here. With gay grammatical abandon, his headline: “No longer taken seriously, we’re seeing the last gasp of climate denial groups” suggests that he and his SkS friends (SkS is the source of most of his science links) are no longer taken seriously. Maybe, but he’s still got space in the media and we haven’t. There’s no opportunity for comments on Ridley’s article at the GWPF, and many of us are banned from the Guardian. Do read Ridley’s article. It ranges far outside the usual climate remit, and should create quite a stir, if anyone is still interested in scientific debate. In short, there is no evidence to count on CO2 fertilization benefit. Personally, I would not buy the fertilization benefit for the price of global warming (and all the impacts that this warming implies). The whole Lewandowsky package, in fact. Previous post ← Frackity-frack, don’t talk back! I wonder what the Royal Society’s bouncers made of it. A magnificent illustrated talk. BU professor Mynensis greening response is very revealing of how convoluted and illogical warmunists can be. Tough times for them. South Australia’s overreliance on wind causes a complete blackout. Actual climate sensitivity about half of what is modeled (~1.6 to 1.7 versus 3.2). Sea level rise not accelerating. Polar bears thriving. Arctic summer ice hasn’t disappeared and may be cyclically recovering. And now greening from CO2 fertilization of C3 plants, which will continue because India and China continue to build coal generation. Why is Myneni’s response on fertilization surprising? How do you evaliate that? Well if we’re speaking personally, professor Myneni’s opinion is no more important than yours or mine or the tomato grower’s. Ridley seems to think Myneni’s (et al) research is important enough to quote bits of it each time he opines on climate change. So M’s opinion, based as it is on his own research, should be set above whatever use R makes of said research. Way above my opinion or Ridley’s as well; and above yours too unless you are an expert in that domain. And the benefit to tomatos of elevated CO2 in a highly controlled environment of course tells us that increased CO2 gives the same benefit in agriculture in general, according to you at least. Way above my opinion or Ridley’s as well; and above yours too unless you are an expert in that domain. At which point, Nino should excuse himself from the discussion, he not feeling that he is able to contribute to it. Professor Myneni in his reply spends a long time refuting the second point, going into some detail about the career of one of the thirty odd authors. This refutation is the basis for his accusation that Ridley “assumes that the people behind the science have malevolent motives” and that Ridley is arguing that global warming is a hoax perpetrated by thousands of scientists. As to Ridley’s claim that his (Myneni’s) paper represents “one of the most momentous discoveries of recent years and one that transforms the scientific background to climate policy” – he doesn’t even mention it. Instead he discusses experiments to measure the fertilisation benefit. Myneni seems to be arguing that there is no evidence that more vegetation and less desert is a good thing, and that even if it was a good thing, that wouldn’t alter the fact that more CO2 is a bad thing. He’s already said he doesn’t know what the fertilisation benefit is, and he certainly doesn’t know the price of global warming. But whatever it is, personally, he’s not buying it. Thank goodness his colleague, Dr Zhu, who is credited with being the chief instigator of this discovery, is safely back in Beijing, where he can presumably do science. There’s now a youtube video of the talk. ATTP has now enlightened us; if anyone’s interested. himself has put in an appearance) for those who enjoy such things. Geoff, a 13% overall greeing does not mean a 13% growth in crops. You made that up. Response from Met Office here. It seems they can’t bear to mention Ridley or GWPF. Nino, for wheat it is actually about double 13%. Fitzgerald et. al. 2016, Australian reseach. 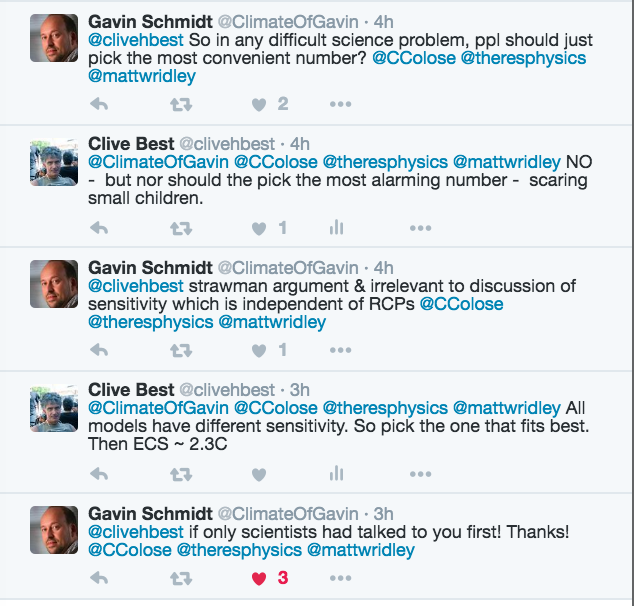 Interesting little twitter spat with Gavin and co regarding their spiteful attack on Mat Ridley. Umm, isn’t it a given that increased CO2 causes climate change? Is it not clear to the Met Office that the issue is one of rising atmospheric CO2 causing global greening rather than climate change (the supposed EFFECT of increasing CO2) contributing to global greening? Why do they so confusingly conflate the cause and the effect in one sentence when attempting to explain the possible reasons for global greening? Why does the Met Office quote the IPCC as saying that there is “low confidence” that climate change is contributing to global greening, when the issue Matt Ridley was discussing seems to have been mainly concerned with elevated CO2 levels causing global greening? Why does the Met Office bizarrely then go on to say that that “recent suggestions that this issue was downplayed in IPCC AR5 are therefore incorrect and misleading” when it has quoted the IPCC as effectively downplaying that issue by detracting from it? How very odd. Gavin Schmidt really never comes across very well. Sigh. How many people have written in depth about what was wrong with the ‘trick’ and that it isn’t about hiding cooling? Perhaps the guy should do a little less communicating and a bit more listening. Ward’s objections to certain statements in Ridley’s lecture seem justified to me. Which is not to say that I agree with Ward’s conclusion that Ridley should be chained to Lord Lawson and thrown into a pit of ravenous man-eating Oreskes, or that the GWPF should be declared a terrorist organisation and its members detained without trial. Some clarification on the part of Matt Ridley would certainly be welcome though. In the meantime, I’ll be trying to do some clarification of the work of Professor Ranga Myneni. NINO is partly right when he says: “a 13% overall greeing does not mean a 13% growth in crops. You made that up.” I didn’t make it up, but took it from a table in Ridley’s lecture which Ridley took from Myneni and which doesn’t make sense to me. Myneni seems to have taken small (~1%) increases in different kinds of vegetation and added them to get a total. Can anyone explain? “Australian scientists have solved one piece of the climate puzzle. They have confirmed the long-debated fertilization effect.